Why does the ISA Professional Titanium Flat Iron Work So Well When it comes to Straightening Curly Hair? If you are one of the many people that try to straighten your curly hair you may have a tendency to get very frustrated when doing it. You would be in the majority if this is the case. Curly hair has strong protein bonds that are not easy for every flat iron to break down so your curly hair can be straightened. It takes a special flat iron to be able to do this. We heard one flat iron that makes straightening curly hair less frustrating is the ISA Professional Titanium Flat Iron. We decided to take a closer look at this straightening iron to see if it works as well at straightening curly hair as people say. Anytime you combine a wide variety of heat settings with titanium heat plate infusion you get a flat iron that will straighten curly hair very effectively. That is certainly the case with the ISA Professional Titanium Flat Iron. Its titanium infused heat plates can be set to heat anywhere from 265°F – 450°F. Its 1” wide heater plates are also ready to straighten hair in just a few seconds after turning this flat iron on. That makes it the perfect flat iron for those of you that seem to always be in a hurry getting ready each morning. 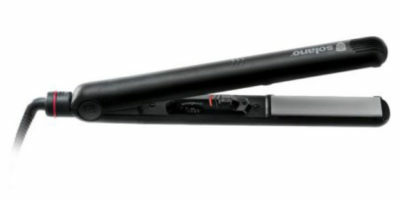 The ISA Professional Titanium Flat Iron has a unique digital temperature display. Its background is bright neon so you can easily see the temperature you are straightening your hair within any light level. There is also a salon length power cord with swivel end on it to allow you maximum movement when using it. When you combine this flat iron’s nicely rounded sides and tip with its slim 1” heat plate width you get more than just a high performing hair straightener. It can also be used to change the shape of your current curls or make your curls wavier. 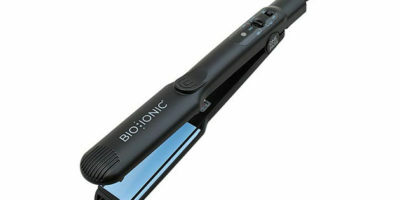 This flat iron weighs just over a pound and will shut itself off automatically after one hour of non-use. One of the best things about this flat iron is its 1” heat plate width. That is a great width for straightening any length curly hair. It also enables this straightening iron to become a curling tool or it can help you change your curls into more of a wavy shape. The heat plates on it are also titanium infused with a smooth mirror finish. This means the plates stay hot during the entire curly hair straightening process. This is a critical function when straightening sometimes stubborn curly hair. The smooth finish on the plates also allows your hair to slide across them easily. This tends to speed up the curly hair straightening process too. The warranty you get with this flat iron is very average, to say the least. You are protected for 2-years from the date of purchase. One of the complaints we heard about this straightening iron is that its longer heat late design takes a little getting used to for some. Other did not like the position of the on/off and heat selection buttons. They feel they are easy to accidentally hit when using this flat iron. Overall we would have to say this is a good flat iron that is very versatile. Its wide range of temperature settings and steady heating titanium infused heat plates make it ideal for use on all types of curly hair. 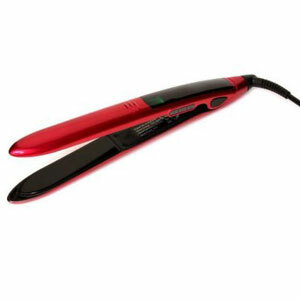 It should help you curl your hair faster and more effectively to thanks to its high gloss mirrored heat plate finish. We have no problems recommending this flat iron to anyone with curly hair that wants less frustration when trying to straighten it.